Ease of use. 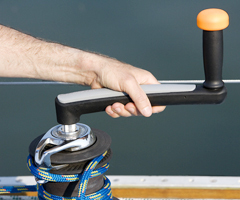 The Dax OneTouch winch handle is designed for one-handed use. The OneTouch design enables you to quickly put the OneTouch into my winch with one hand and remove it with one hand. I found it easy to get it in the winch on the first try with both my strong and weak hands. To remove the OneTouch you simply grab the winch handle anywhere on the throat, squeeze the release (that is the throat) and pull it out. Anyone who has ever had to use two hands to yank their handle out of the winch will know how important this can be during a sail. It is the difference between a smooth controlled tack and a stressful one. Reliability. The Dax OneTouch locking mechanism works every time. With conventional winch handles, the locking square at the tip of the handle sometimes lines up for easy removal and sometimes it doesn’t. This uncertainty is problematic. The Dax OneTouch mechanism releases reliably every time. Superior sail trimming. The Dax OneTouch has a signature large orange knob that lets you get a good purchase on the handle with two hands when cranking. This design helps to get you jib trimmed into position more quickly and with less effort than with a conventional winch handle. In addition, the OneTouch is light-weight, the bearings are ultra smooth and on a subjective level the bright orange handle looks sporty and helps you easily locate it pre-tack. The OneTouch lets you focus on the task and not the tool. You can find out the details of the technology behind the Dax OneTouch on the OneTouch website - there is a lot on the technical side of things that sets this apart from the conventional products. 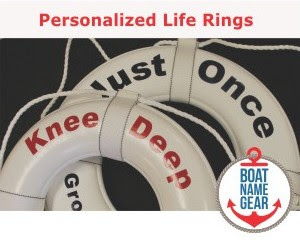 Tested and reviewed by Mark Sutton of Marine Product Reviews. 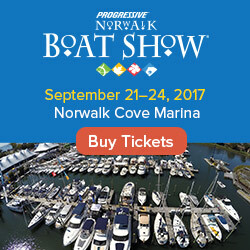 Check out the review of the Dax OneTouch and other products at marineproductreviews.com.